One of the major recipients of H1B visas in India, Infosys is going overseas at an aggressive pace to strengthen its global workforce with trained American workers. 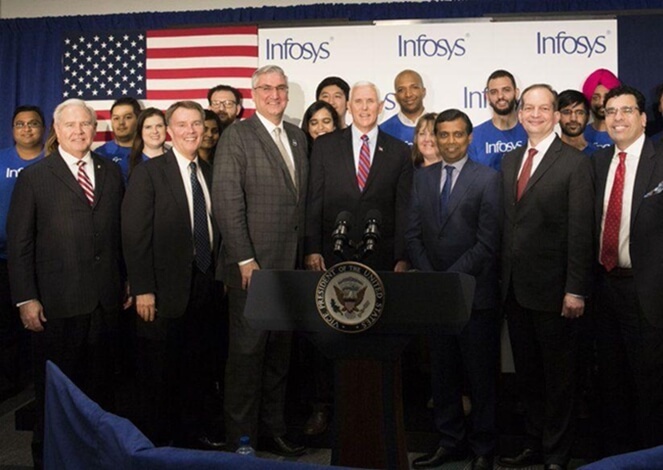 After having announced to create over 1000 jobs at its upcoming $21-million technology and innovation hub in Hartford, CT in March this year, Infosys plans to open an education center in Indianapolis for American workers and create nearly 3000 new jobs by the end of 2023. It seems the beginning of a downward or reverse trend for the few Indian IT companies including Infosys, which have been sending their Indian professionals to the United States on H1B visa for years. Owing to the Trump government’s stiff anti-immigration stance, the number of H1B visa approvals for the top 7 Indian IT conglomerates dropped by 43% between 2015 and 2017. In FY 2015, 14792 H1B visas were granted to Indian IT giants including Infosys, TCS and Wipro. The figure was cut by almost an half in FY 2017. To be integrated into Infosys’ new technology and innovation hub in Indianapolis, the proposed education center is supposed to transform a 70.5-acre site at the old Indianapolis airport terminal. Infosys will initially invest $35 million to develop 125,000 sq. ft. of the facility at the first phase, where the IT giant’s American workers will be equipped with requisite skills for the coming decades of digital technology. The ground-breaking ceremony for the initial phase of the proposed Infosys education center in Indianapolis is expected to be held before we ring in 2019. The first phase, which will include a training center with a 250-person residential facility, will be completed by the end of 2020. The center will also be used as a seat for development of next-gen digital tools and technologies. In a recent media release, Infosys asserted its hiring plans to create new jobs from 2000 to 3000 until the end of 2023, as part of the previous commitment to build a US workforce of 10,000 and invest in their training for the changing digital landscape. 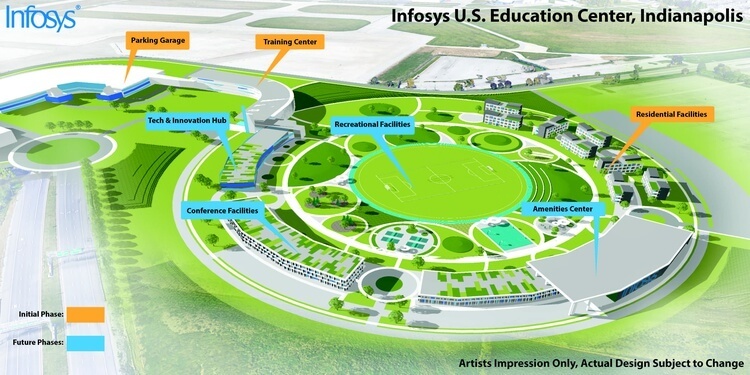 The US state of Indiana and its capital Indianapolis have announced to offer incentives worth $101.8 million for the upcoming Infosys education center in Indianapolis over a period until the completion of the project. Infosys’ plan is to develop a $245-million campus over an area of 141 acres in a phased manner. Infosys will receive conditional tax credits up to $56.5 million and training grants worth $1.5 million from the state government. The incentives and grants depend on the company’s capital investment strategy and job creation plan. Indianapolis and the state will jointly contribute $37.8 million to the project’s infrastructure development. The upcoming Infosys education center in Indianapolis will deploy the best practices and training methodology from the company’s Global Education Center in Mysore, India. It will seek partnership with the world’s leading education providers. The Indianapolis education center of Infosys will have training programs designed combining classroom-based teaching and immersive, interactive learning. Infosys’ American workers will be given lessons on key competencies including big data, cloud technology, computer science, user experience and digital economy. Travel Beats is a thriving Indian community portal in USA owned by Indian Eagle, a trusted travel booking organization for Indians in America. Subscribe to our free newsletter and stay tuned to latest news & stories about Indian Americans, Indian events in US cities, US visa & immigration news, US to India travel updates, and airfare discount campaigns.